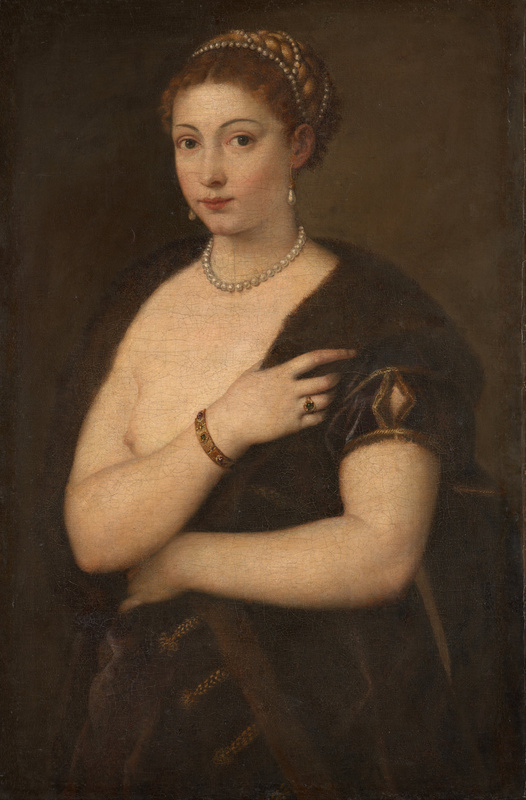 Titian, Woman in a Fur Coat.1535. Kunsthistorisches Museum, Vienna. For Renaissance Europeans, animal fur was a desirable but complex material. It was a high status commodity, lining (or appearing to line) fine garments. Yet it was also an animal skin, as worn by Adam and Eve after the Fall. The lack or presence of fur, some fifteenth-century humanists claimed, was a key marker of difference between animals and humans. Fur was at once civilised and wild. The ability to depict the textures and tactility of fur, such as that covering Castiglione in his portrait by Raphael, or in Dürer’s 1500 self portrait, was a sign of painterly skill, lavished not just on garments but also the ‘living’ fur of animals gently stroked or inviting the viewer’s touch. Fur in its correct context could be appealing, but was firmly animal. There was little room for human body hair in the renaissance aesthetic – hair on men was largely restricted to the genital area, and women’s bodies were typically depicted completely hairless. In this session we would like to interrogate renaissance attitudes to skin, fur and hairiness, examining the beauty ideal applied to both human and animal, and placing aesthetic preferences within a broader discourse of humanity versus animality. Perceptions of hairiness as indicating the boundaries of humanity, including consideration of “wildmen”, and “hairy girls”. Gender and hairiness; hair removal practices and notions of femininity; beards and masculinity. Owner identity expressed through the animals they owned and chose to be portrayed alongside. Aesthetics and companion animals; animal breeding for desirable coats; softness, fluffiness and affective bonds. Fur wearing and its social and aesthetic implications. Each proposed paper must include: paper title; abstract (150-word maximum); keywords; and a brief curriculum vitae (300-word maximum). Please get your proposal to Dr Jill Burke (Jill.Burke@ed.ac.uk) and Dr Sarah Cockram (S.Cockram@ed.ac.uk) by 24th May 2013.